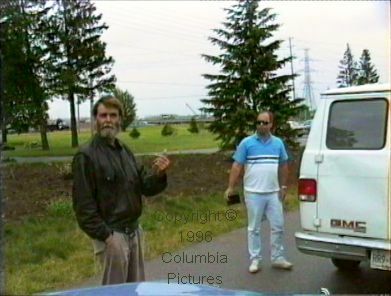 This review includes the documentaries Operation Migration and The Ultra Geese, both supplied on the Columbia Tristar DVD along with the main movie. 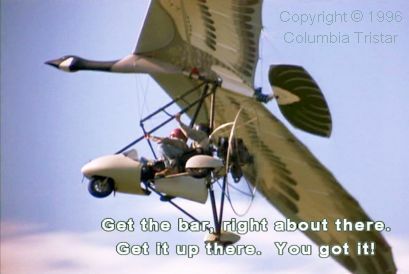 Fly Away Home is a fictional story based on the adventures of Canadian hang glider and powered ultralight pilot Bill Lishman, along with other pilots and biologists who study migrating birds. It contains some of the most stunning flying motion photography you are ever likely to see. The cuts between film (or video) of real flying and closer views of actors in the pilots’ seats (or hang cage, or whatever) are seamless. The whole film is made to the highest standards. The Icarus II was a ‘rigid’ hang glider (in other words, not a Rogallo flexwing) of biplane construction in the early 1970s. It was designed and built by Taras Kiceniuk during the emergence of modern hang gliding in southern California immediately following the cessation of the lunar landings and the Vietnam War. 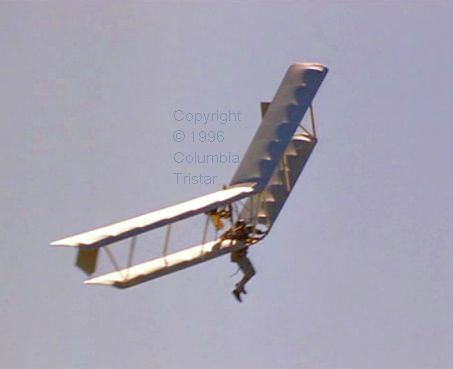 In about 1975 production was taken over by Ultralight Flying Machines, who renamed it the Easy Riser. It is the first flying machine that appears in the story. 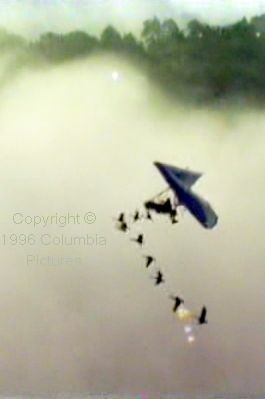 Although the Easy Riser hang gliding scenes do not take up much of the story, each hop required several attempts, as is normal with making movies. …we spent six weeks of long days with cables, cranes, a hydrostatic winch and helicopters portraying flying in those early days. 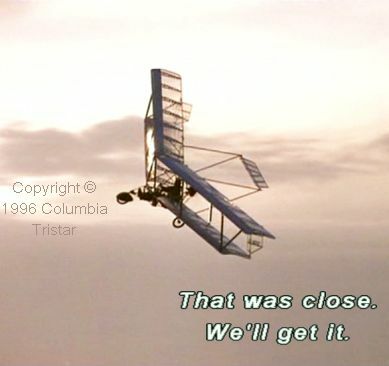 As always, my eyes ran over the glider’s structure. Was that a crack by the lower trailing edge/hang cage bracket? Oh my gosh, it goes right around! How did we miss it during our preflight inspections? A slight tug and it pulled apart! 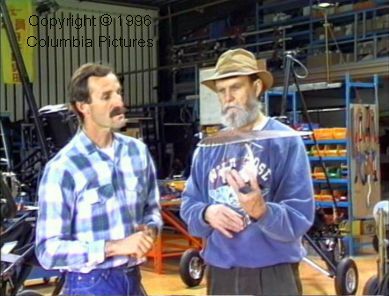 Whether by accident or design, the movie documents the evolution of this lineage from ‘free flight’ (unpowered) rigid hang glider to the most basic powered rigid hang glider. 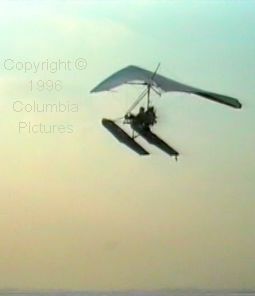 The Easy Riser was a popular choice among the early adopters of powered hang gliding and the Power Riser is the second aircraft in the story. That basic configuration was achieved by adding an engine and propeller between the wings and behind the pilot. In the story, the main pilot (Amy’s father) comments that landing one of those on your feet, with its high centre of mass, can be somewhat dangerous. The next outing in the film is of a Riser with wheels and a tail unit. According to Michael Robertson, the original Riser was too sensitive in its pitch handling, which the tailplane helps with. Many of today’s rigid hang gliders have tailplanes, as do some flexwings. Many mornings before breakfast or on clear evenings before sunset I would wander off through the air currents like a lone hawk, turning lazy circles a few hundred feet in the air, absorbing the countryside, living in that sea of air above the ever-changing terrain. 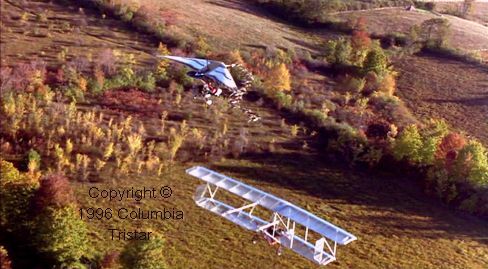 The film also includes a Cosmos flexwing powered ultralight, developed from the more numerous Rogallo flexwing type of hang glider, which is controlled by weight shift. The Cosmos that Lishman used in the real Operation Migration did not have the goose neck and tail, but when the Canadian movie industry steps in, almost no expense is spared! Some of the filming is magical. At one point, we are looking down on the Cosmos Trike apparently flying above clouds, but with sky instead of land between the clouds, which of course makes no sense. The camera then zooms out to reveal the upside-down underside of the flying machine reflected in the mirror-like surface of the lake it is flying over. You have to see it! I don’t want to give away the plot, such as it is, but flying low and slow in ultralights to avoid being acquired by military radars is not fiction. British pilots Ben Ashman (of Flylight) and Judy Leden (of Airways Airsports) did exactly that on one international expedition when they failed to receive permission from certain governments to enter their airspace. The film includes a mini tour of the 94th Airlift Wing at Niagara Falls Air Force Base, awkwardly woven into the story. In the screenshot, notice the Cosmos at the back between the C-130 fuselage and the people, and you might also be able to make out the Power Riser at the back on the right. Maverick and Goose. Well, mavericks and geese, anyway. The trouble I had with capturing screenshots of the flying scenes in this movie is that I had so many, I was unable to pick a representative one. Se here is another. You might be able to make out the geese in a reversed S-shaped line by the right leading edge of the flexwing. They are easy to see in the actual film because of the three-dimensional motion of the aircraft’s and birds’ trajectories over the ground and the additional movement of the camera helicopter, from whose viewpoint we see the action. 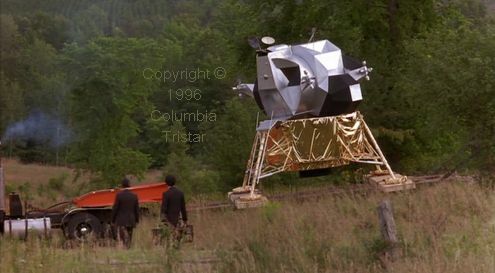 The accompanying screenshot shows one of Lishman’s creations; a full size replica Apollo lunar lander. The snows came. I put the Riser away in my makeshift hangar (capital cost, twelve dollars) and busied myself with the major sculpture commission I was working on for Expo ’86. Then, later that winter, disaster struck, neither the first nor the last in my long affair with ultralight aircraft and geese. The hangar collapsed under a huge snow load and completely crushed the Riser, putting that part of my life back to square one. 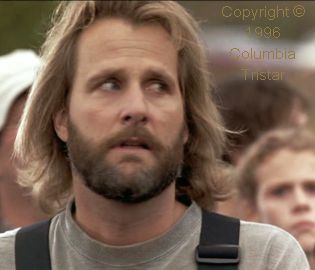 In my opinion, Jeff Daniels does an outstanding job of playing the part of sculptor, inventor, and aviator Bill Lishman, fictionalised as Thomas Alden. Early scenes in his workshop are thoroughly researched and recreated for the camera. The whole film is an outstanding example of story-telling, via moving images, imparting as real an experience as possible, all without resorting to the cost-cutting MacGyverisms so evident in most films. Thomas’s office/studio is an awesome construction of Canadian light and space, with the balsa frame of an old fashioned model airplane hanging from the ceiling, a similarly old fashioned tilted drawing board, a modern computer terminal on the other side the room so far away that you hardly notice that Thomas’s brother is working there planning the mission. It is a boy’s dream den brought to reality. All lit by slanting sunlight coming through old square-paned windows. One of the scenes shows the two ultralights and the geese entering a fog bank and blundering into the streets of a city at mid-skyscraper level. 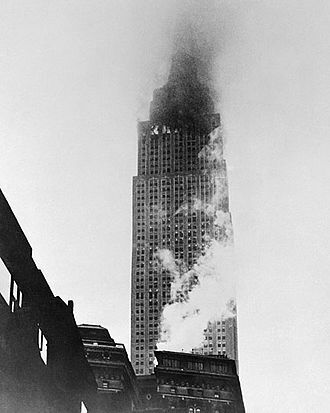 (It brought to my mind the nightmare of the 1945 crash of a B-25 into the Empire State building.) It is done so realistically (I assume – I hope! – it is computer generated) that the inclusion of the scene, although adding ‘excitement’ to the story, detracts from the real flying because viewers might conclude that all the flying in the film is computer generated. 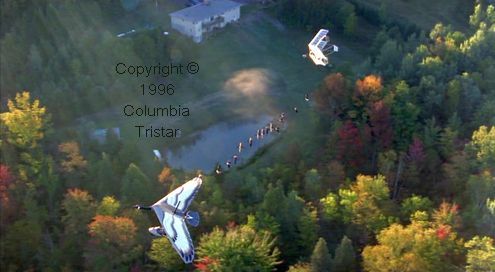 The first flying scene is of Canadian hang gliding instructor Michael Robertson launching at dawn in the Easy Riser biplane rigid hang glider. He gains height and soars! It was done with the aid of a winch and tow line, soaring conditions being generally unavailable at dawn. I guess only gliding people are likely to spot this minor deviation from reality, which was doubtless evaluated against its advantages in terms of advancing the story. 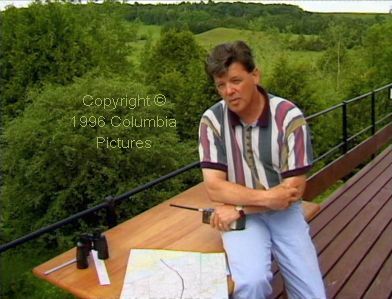 Having talked up the great aerial filming, some of the early flights, filmed from the ground, seem to me too fragmented. I was unable to turn off the subtitles until I figured out the appalling user interface. The dreadful user interface of the menu computer program on the DVD caused me to watch it with English subtitles turned on. Eventually I figured out, by ‘minesweeping’ with the mouse cursor, how to turn them off. 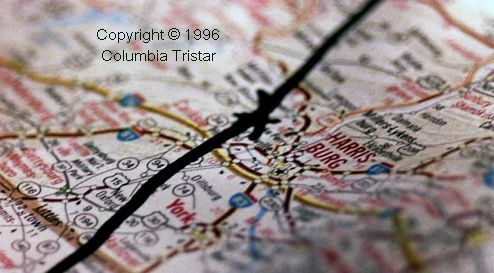 Columbia Tristar (or whoever is responsible) should have tested it on real users to identify and correct such problems before releasing it for sale. It is not a criticism of the film itself, of course, but it does mar the experience of watching it. And a point I also made in a previous review – a criticism of the movie industry in general rather than of any particular film – the pilots should come first in the list of credits, before the actors, not way down past the key grips and gaffers. 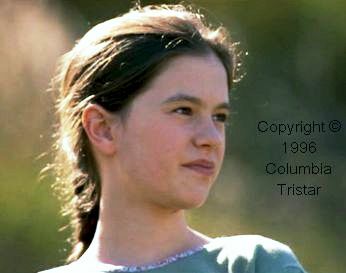 Robertson is eventually mentioned as a glider stunt double and hang glider pilot. So, flying is just a stunt? 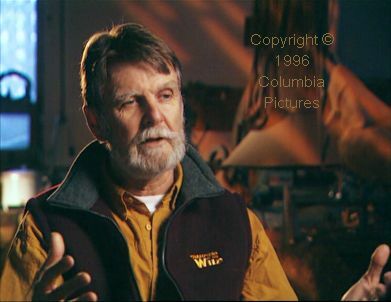 Fly Away Home is based on experiments that Bill Lishman and others carried out in attempts to train birds that, for one reason or another, lost the ability to migrate. That ability is passed down the generations by example, although of course these birds have the genetic instincts to learn a route. Regardless, missing a single year potentially wipes out millennia of migratory behaviour, which in the extreme can place the identity of the whole species at risk. Those experiments are documented in the ‘Exclusive Featurette’ titled Operation Migration – Birds of a Feather, included on the DVD. We also get to meet hang gliding legend Gerard Thevenot, builder of the Cosmos flexwing powered ultralight. You don’t need to understand French to follow the gist of the conversation. After Lishman shows his model of how he wants a goose neck stuck on the front of the Cosmos, the expression on Thevenot’s face is priceless! 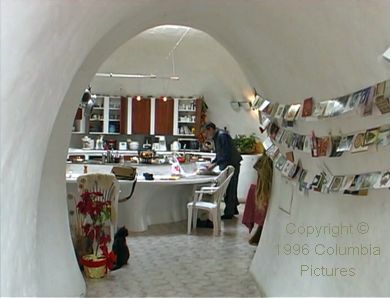 Lishman’s underground home. You see his own designed refrigerator in the movie! 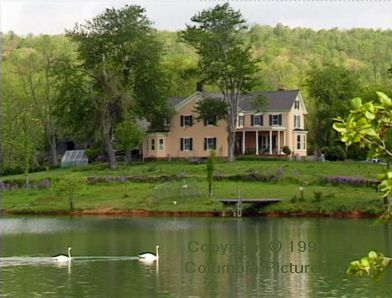 Fly Away Home is of the best flying films I have ever seen, despite a couple of minor weak points. It was released in a period when every man and his dog seemed to be training geese to follow them in a powered ultralight. Each such individual was apparently unaware that it had all been done before. There were so many home movies of people running around fields with their arms out and a pack of birds running along behind. And there was hours of it, as if it was the most interesting thing to watch! Don’t make the same mistake I did of assuming this is another such film and wait 20 years before watching it. It is not. It is a proper flying action movie. The supporting documentaries supplied with the DVD, although naturally not of as high a production standard as the movie, are also worth watching if you are interested either in flying or in bird migration.